Wow, I'm speechless! An award?! A huge thank you to Sylvia of A Baked Creation for passing on the award to me. While this blog is a hobby of mine and certainly not as lovely and professional as some of the other food blogs out there, it's lovely to be recognized, especially with a creative award. Thank you Sylvia!!! 2. 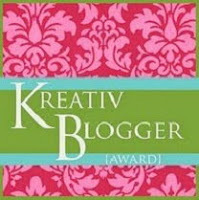 Copy the award logo and place it on your blog. 1. I can speak 4 languages. English, Cantonese, French, and Italian. Granted, I've probably forgotten a lot of my Italian by now! 2. I can play the piano. I learned the piano all the way up to Grade 9 before I gave it up. 3. I always have some form of a bruise on my body. I'm a big klutz. I'll clearly see a bookshelf or doorframe in front of me, and will still manage to walk right into it. 4. Sometimes when I'm walking down a sidewalk by myself, I'll try to avoid stepping on the cracks in between each cement tile. 5. I really, really dislike ironing. Even more than cleaning the bathroom or taking out the garbage. 6. I love old-school musical films from the '40s and '50s. Some of my favourites include Singin' in the Rain, Seven Brides for Seven Brothers, and Meet Me in St. Louis. 1. Ivonne of Cream Puffs in Venice - I've been a long-time fan of Ivonne's blog. Gorgeous photos of her baked goodies. She also hosts the fabulous "Magazine Mondays." 2. Jen of Echo Hope - In a world tainted with wars, violence and disasters, Jen brings sunshine and hope into our lives. 3. Don and Jen of foodiePrints - An incredibly lovely foodie couple in my hometown of Ottawa. They are foodie gurus of all things delicious in the city, but they also know their way around the kitchen. Self-proclaimed pho lovers. 4. David of Food with Legs - This man cures his own meat. Enough said. 5. Mel of Gourmet Fury -She's always an cooking inspiration to me. Her posts and tweets always makes me drool. Check out her amazing food photography. 6. Mark and Stacey of Tasting Toronto - All things delicious in Toronto. 7. Sarah of What Smells So Good? - Her baking posts are divine, and she loves to play with different variety of flours and grains. Posted by Bonita at 9:32 p.m.
vicky March 22, 2010 at 11:34 p.m.
way to go Bonita!! Congratulations. Mel- GourmetFury.com March 24, 2010 at 5:29 p.m.
Don March 24, 2010 at 6:52 p.m.